I decided to make banana muffins for the same reason as most, because I had extra bananas that now had brown spots on them. (I actually like eating bananas slightly under-ripe when eating them raw.) My first thoughts were banana blueberry muffins. Doesn’t that sound good? Yes, but there had been a forecast of thunderstorms coming and I was afraid to go out. I am very afraid of rain, as if the wicked witch of the West, I apparently think I’m going to perish every time it more than drizzles. 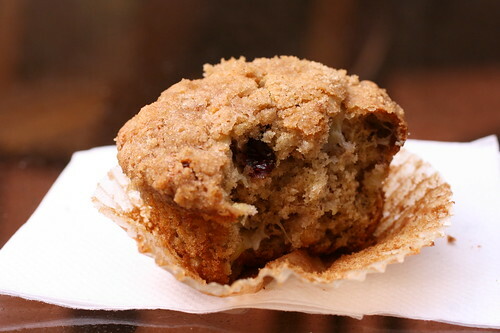 Enough about me, the muffins became an experiment on Banana Crumb Muffins with Cranberries instead, which turned out to be a real keeper!! These are the most delicate of muffins, and taste so grandmother-made (ok, I don’t even have kids yet). These could never be mistaken for store bought treats and will definitely send the message of love when you give them out. Preheat oven to 375 degrees F (350 degrees F if using convection). Line pan with muffin papers. 1. Mix together AP flour, whole wheat flour, baking soda, baking powder, and salt. Set aside. 2. Beat together bananas, sugar, egg, and canola oil. Stir the wet mixture into flour mixture just until moistened. 3. 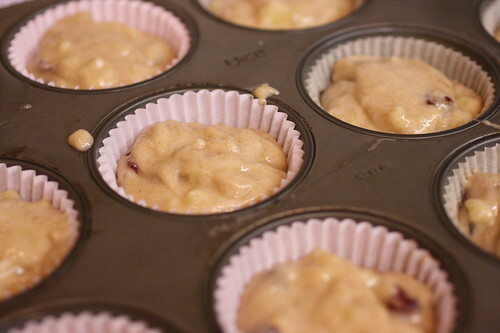 Fold dried cranberries into batter. Do not over mix. Spoon into each muffin cup. 4. 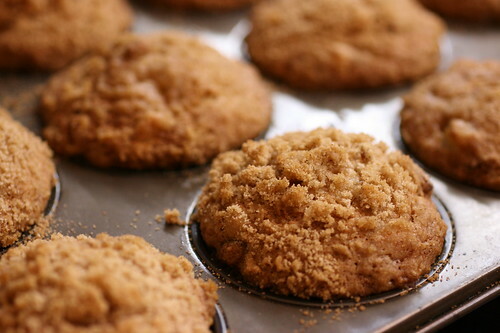 In a small bowl, combine brown sugar, 2 tablespoons of AP flour, and cinnamon. 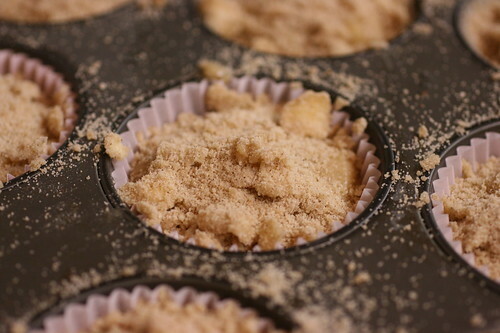 Cut in cold butter until it resembles coarse sand. Sprinkle over the muffins. 5. Bake for 18-20 minutes, or until a toothpick comes out clean. 6. Let it cool in the pan for 10 minutes before removing. Then put them on a wire rack and continue to cool. I couldn’t resist biting into one, straight out of the oven, so I don’t really expect you to wait for them to cool. I will probably be trying a variation with blueberries next week. posted by jessica	at 06:08 PM	Filed under Desserts, Recipes. You can follow any responses to this entry through the RSS 2.0 feed. Both comments and pings are currently closed. I’ve been looking for a simple way to use overripe bananas. I’m going to give this a try! I love the taste and texture of un-ripe bananas and prefer that over ripe ones too. I’m bookmarking this post so I can try your recipe soon. Sheng and Ellen, I’m so excited that you’ll be trying this recipe!! Please show us pics!! I will have to try these, they look so great and really moist. Katie, these are wonderfully moist. Please send me pics if you try them! Thanks PaniniKathy, I’m so happy to have made you happy. Isn’t that what is so wonderful about food? The sight, smell, and taste of food has wonderful powers! I have made this recipe dozens of times, with cranberries and walnuts, with chocolate chips, and exactly per your recipe. Your recipe is fabulous, infallible, and my entire faily thanks you. I am, incidentally, 87 years old and do most of the food prep for my 3-member, 3-generations, household. Thanks Helene! You rock! and your family is lucky to have you at the stove/oven!